A Notice of Intent To Prepare an Environmental Impact Statement (EIS), New Mexico Unit of the Central Arizona Project; Catron, Grant, and Hidalgo Counties, New Mexico was published in the Federal Register on June 12, 2018. Please see the NM Unit EIS Project Website for additional details on the NEPA process including public scoping, project description, and schedule. Background: The Colorado River Ba sin Project Act of 1968 and the 2004 Arizona Water Settlements Act (AWSA) authorized the Central Arizona Project (CAP) to deliver Arizona's allocation of Colorado River water to central and southern Arizona. It also authorized the Secretary of the Interior (Secretary) to enter into contracts with water users in New Mexico for consumptive use of water from the Gila River in exchange for delivery of CAP water to downstream users in Arizona. The Secretary may contract with users in New Mexico for up to an annual average of 14,000 acre-feet of water over any consecutive 10-year period. Additionally, the AWSA ratified the Consumptive Use and Forbearance Agreement (CUFA), signed by Gila River users downstream in Arizona. 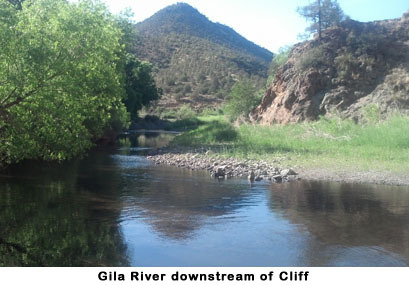 The CUFA details the conditions that must be met for New Mexico to be able to divert water from the Gila River and tributaries. Since passage of the AWSA, the New Mexico Interstate Stream Commission (NMISC) has requested Reclamation's participation and technical assistance in various activities including appraisal-level analyses for assessing diversion and non-diversion proposals in southwestern New Mexico. New Mexico, through the NMISC, notified the Secretary on November 24, 2014 that they intend to pursue a New Mexico Unit of the CAP (Unit), under the AWSA. 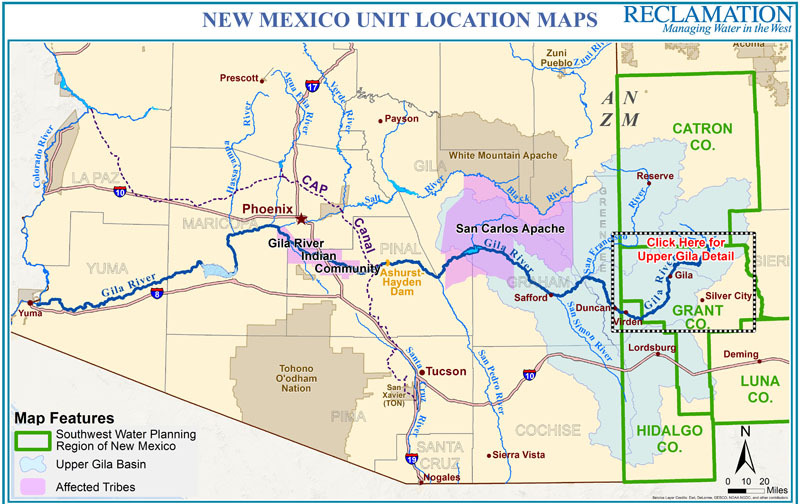 A Unit is a diversion from the Gila River or tributaries requiring delivery of CAP water to users in Arizona in accordance with the CUFA. The AWSA required the Secretary and the New Mexico CAP Entity (Entity) to sign the New Mexico Unit Agreement (Agreement) within one year of the State's notification. The Secretary and the Entity executed the Agreement accordingly in November 2015. 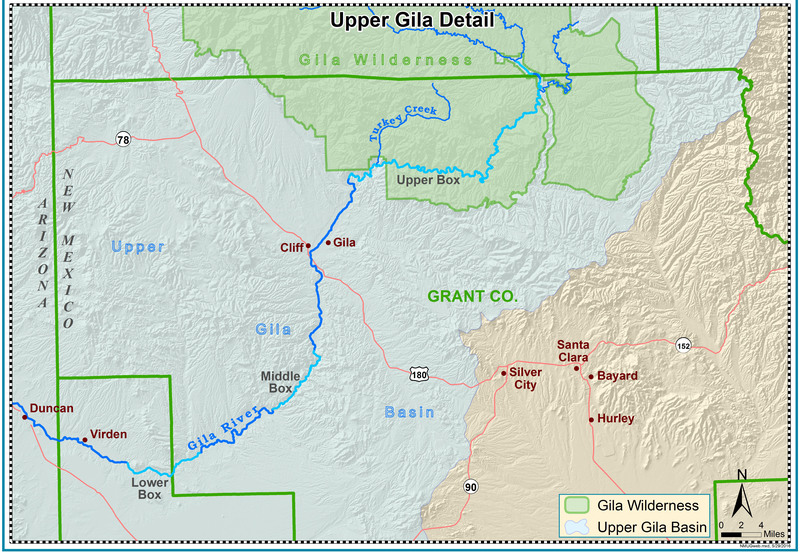 Area of Interest: The area of interest includes the Gila River and its tributaries and four counties in southwestern New Mexico: Catron, Grant, Hidalgo and Luna Counties. * If you would like to be on our email distribution list to receive updates on this process, send a request to the email address above.